Browns quarterback Johnny Manziel will remain the team's backup while the league investigates his domestic incident from two weeks ago. The Browns couldn't have suspended quarterback Johnny Manziel for his domestic incident even if they wanted to, according to general manager Ray Farmer. 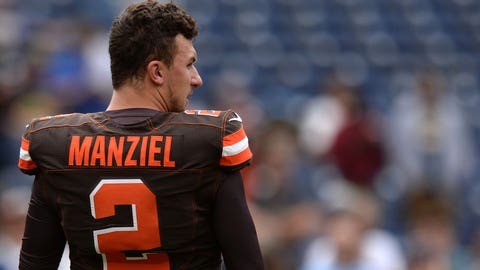 Farmer said Tuesday that the team's only option would be to deactivate Manziel since personal conduct violations fall under the league's purview, according to ESPN.com. After reviewing all of the information available, the team decided to inform the league, rather than making Manziel inactive. The league has spoken to local authorities as part of its investigation, but Manziel said after Sunday's loss in St. Louis that he had yet to speak with anyone from the NFL. Manziel and Famer have discussed the situation. While Manziel admitted in the police report from the incident that he had been drinking, he has denied making physical contact with girlfriend Colleen Crowley aside from grabbing her wrist to prevent her from exiting his moving vehicle. Manziel served as the backup to Josh McCown this past Sunday, and entered late in the fourth quarter after McCown suffered a shoulder injury. If McCown isn't healthy enough to start this Sunday against the Arizona Cardinals, Manziel will get the nod.